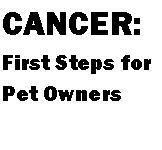 Finding out that your dog has cancer can be a very stressful and overwhelming experience. It can be hard to know where to turn or what to do to first. Cancer: First Steps for Pet Owners is a new brochure from Georgia’s Legacy designed to help pet owners during those critical moments so they can begin their journey and start making those important decisions about their dog’s treatment plan. Click on the image above to download a PDF of this new resource for pet owners. We hope you find this brochure helpful, and encourage you to share this link with friends or family members who have recently discovered their dog has cancer. Please feel free to share it with your veterinary team as well so they can offer it to their clients when faced with a new cancer diagnosis to provide them with a tangible place to start fighting the good fight. I am a Bulldog mom, Reiki Master/Teacher, pet loss counselor and canine cancer advocate who loves working with people and animals to help them live longer, happier and healthier lives. This entry was posted in News and tagged canine cancer, canine cancer brochure, canine cancer treatment, dog cancer, dog cancer resources, veterinary care. Bookmark the permalink.